Long time no blog, how you guys been? I've been head down with editing wedding videos at the moment so the blog has been a bit neglected, oops. I know a lot of you guys are so good with posting regularly so excuse my sporadic posting! Anyway I did want to share with you guys a beauty post today. During the Summer, I've been reaching for these products to give my skin that extra glow and radiant and they're fab. Hope you enjoy the review! 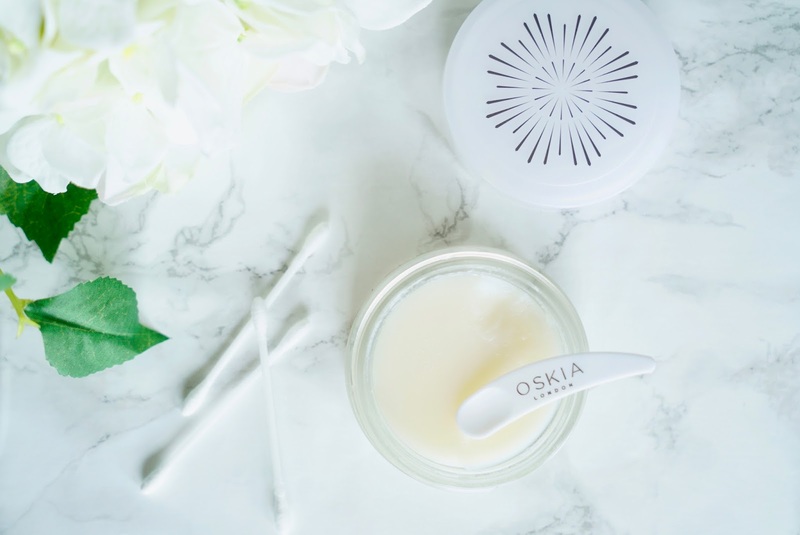 I'm sure you guys know Oskia, the skincare brand has gained cult status over the last few years. Who hasn't heard of their Renaissance Gel? 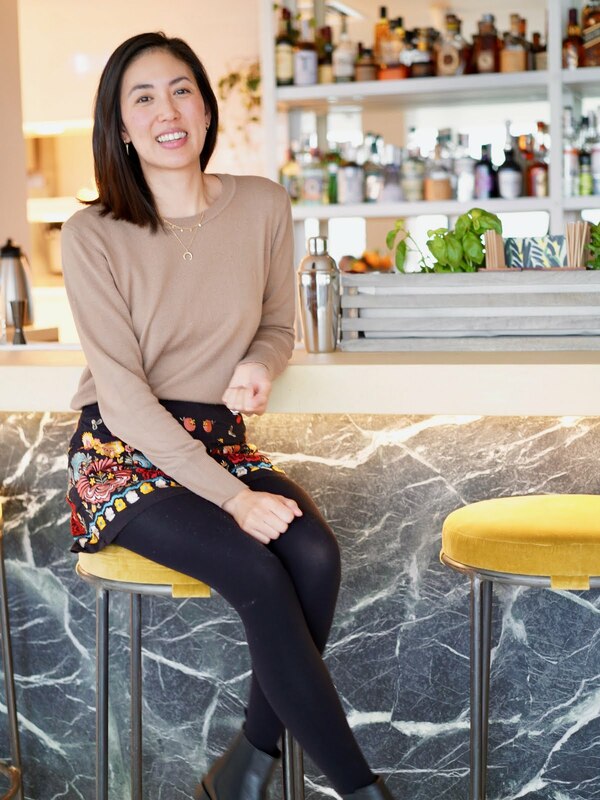 After listening to Anna and Lily's At Home With podcast featuring Oskia founder Georgie Cleeve, I was even more impressed with the brand ethos, the science behind the products and their natural nourishing ingredients. 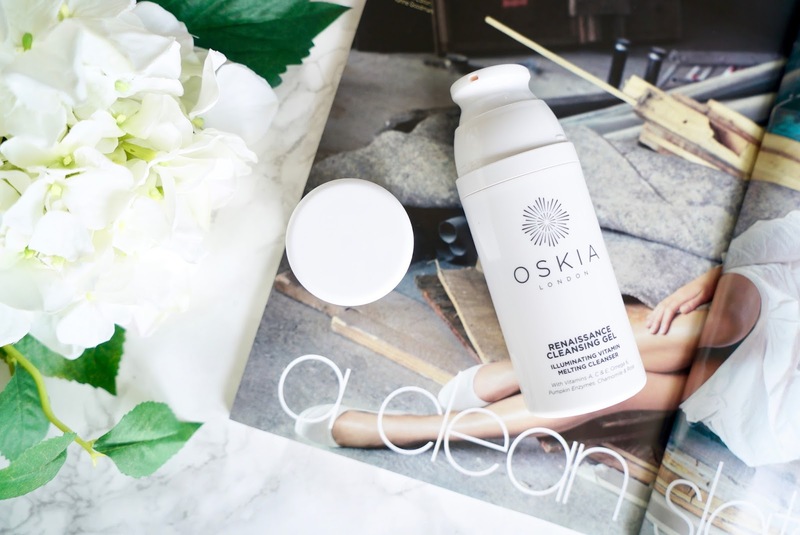 So what better product to try than the best seller Oskia Renaissance Cleansing Gel* (100ml £29.50) This is an 'illuminating vitamin melting cleanser' and packed with vitamin A, C & E to restore and protect the skin. The pumpkin enzymes cleanses pores and removes dull skin cells. It gently remove makeup and impurities, keep skin balanced and fresh and suitable for all skin types. So did it live up to the hype? First off I really like the simple and clean packaging, the pump is easy to use and it doesn't look messy in my cabinet, I know you can't see when the product runs out but that's not a biggy for me. The gel is a pinky orange colour and the scent of chamomile and rose smells so nice and uplifting. I use 2 pumps and massage onto dry skin, I then add water and the gel turns milky removing dirt and grim. It feels so gentle and soothing on the skin. Whenever I used this, it feel like it's such a treat for my skin, like having a mini facial. Compared with oil cleansers, which can feel thick and heavy this is great to use day or night before your second cleanse. This is has been great to use in the mornings as it really perks up my skin and leaves it soft and dewy. I didn't used to be too fussed with my morning cleanser but I would happily only use this product from now on as I feel like it's doing my skin good. I would repurchase this as I like how it's non foaming, gently cleanses the skin and leaves it soft and smooth. 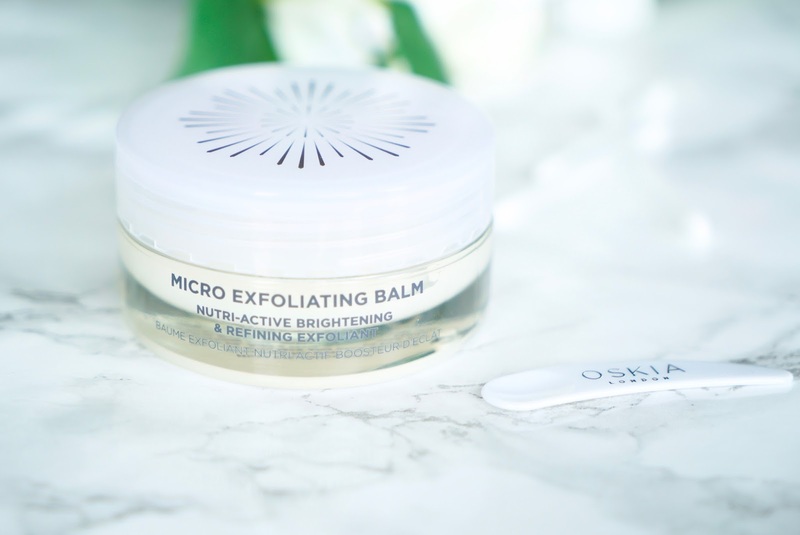 Another Oskia product I've been really enjoying using lately is the Micro Exfoliating Balm* (50ml £48) I was kindly gifted this item and I know the price tag is not exactly purse friendly but I do believe investing in skincare. I've spent £45 on serums in the past, it can add up but you only have one face right :) This balm is a nutri-active nourishing and refining polish. It bursting with vitamins, minerals and omegas 3, 6 & 9. Even though it's Summer, my skin can get dull and dry so this creamy balm gives my skin a healthy radiant glow. Use the scoop to get the product out of the pot and massage onto your skin. This is a clever product as you can use a little or a lot of water depending on how deep you want to exfoliant your skin. You will feel the micro granules exfolianting your skin but not in a harsh way - not like those beady scrubs! The product turns into a milky texture and you can buff and polish your skin using your finger tips. I love using acids to exfoliant my skin but sometimes something a bit more manual like this really feels good on your skin to unclogs those pores and buff away those dead skin cells! The first time I used it I was shocked with how my skin looked straight away, it looked fresher and brighter, not dry or tight at all - I was amazed! When you open the pot it smells gorgeous with the scent of rose, lychee and peppermint. I'm still deciding if I would repurchase, lets see if I can't live without it when it's finish! My skincare routine doesn't feel complete if I don't use some sort of facial mist or spritz. 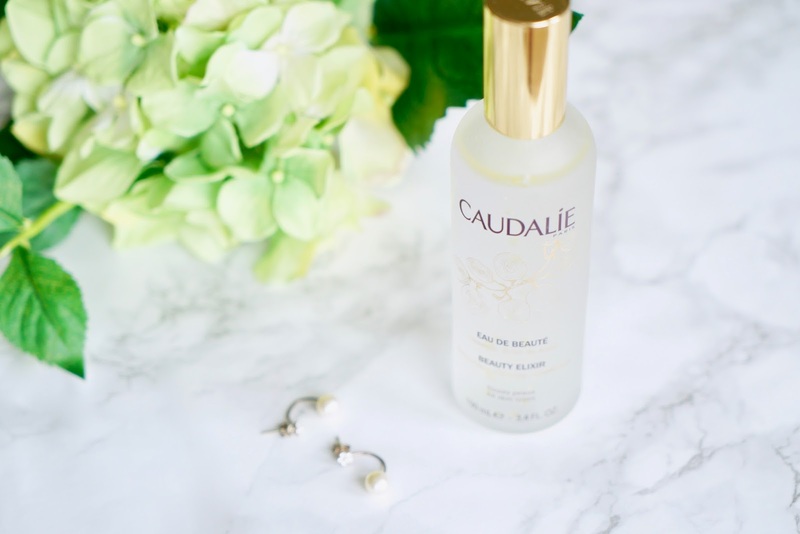 You guys know my favourite is the Caudalie Beauty Elixir* I've mentioned it loads on here and repurchased it several times as I love using it so much. 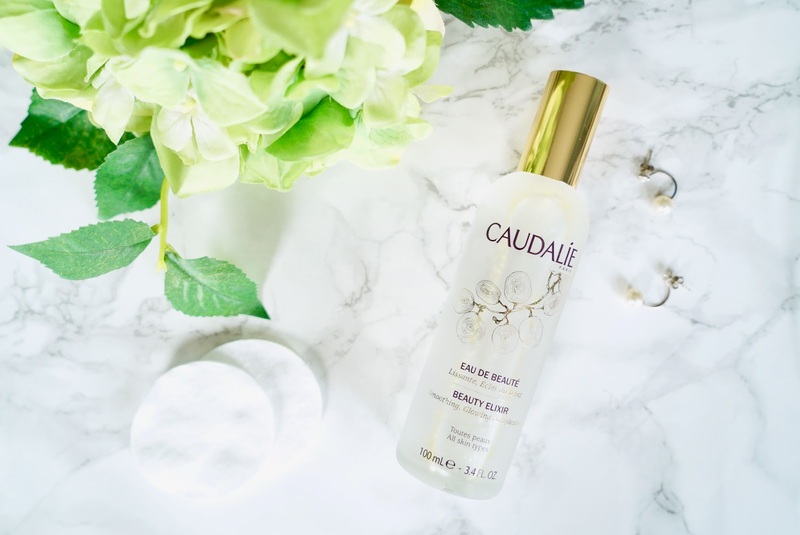 I was sent this limited edition bottle to share with you guys as it's the 20th anniversary of the Beauty Elixir and Caudalie have designed this gorgeous limited edition gold designed bottle. How luxe does it look! So besides from looking pretty on my dresser, this cult beauty product is 100% natural with a blend of orange blossom, grape and rose as well as hints of lemon balm and mint. It's great to freshen up and tone your skin and give it an instant pick me up. I've used a lot of mists and I always favour this one! It's also super versatile, you can use it to tone your skin after your cleanser, use it to set your makeup, after a workout and whenever you just want a pick me up for your skin. When I feel a bit groggy or have that afternoon slump, I reach for this mist. The scent is so uplifting and therapeutic, it makes my skin feel nice and puts me in a relaxed mood straight away. The 30ml version is always in my hand luggage when I'm travelling, it's the only thing that sorts my skin out on the plane. 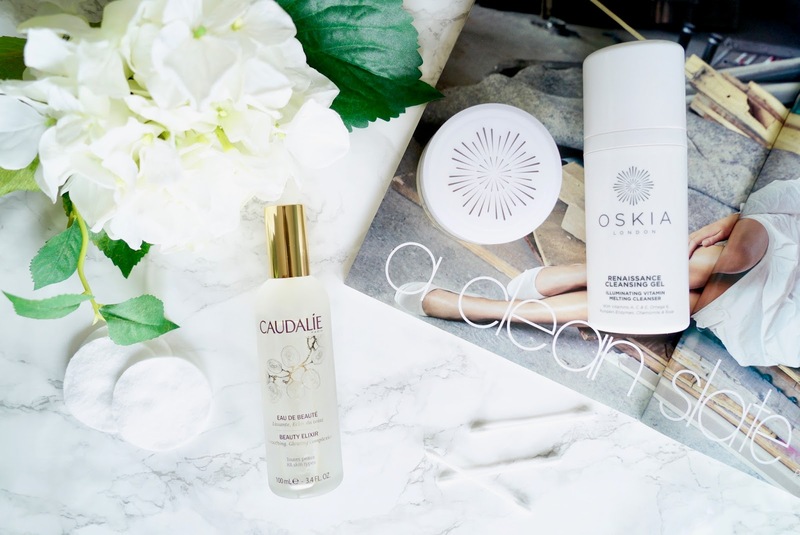 So those are my skincare faves at the moment, I would love to know if you've tried these products and what are your thoughts? How is your Summer going? It hasn't exactly been the best Summer here in the UK with more grey rainy days then sunshine but I'm definitely trying to make the most it! What are your Summer skincare heroes?